During the Paris Auto Salon in October 1950 Ferrari introduced a series of new cars. In addition to the 166 Inter 2+2, the 166 Inter Berlinetta and the 166 Inter Cabriolet, all equipped with a 2 litre V12 engine, there also was a new car with a substantially bigger V12 engine, the Ferrari 340 America. 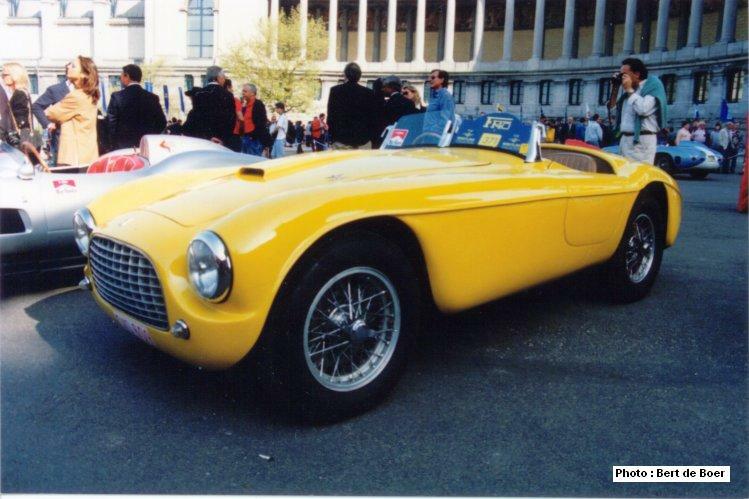 This brand new Ferrari was 'clothed' with the very popular 'Barchetta' coachwork designed and built by Touring of Milan. As usual at that time, the new Ferrari received, as type definition, the capacity of one cylinder. By simple multiplication of the tipo number the total engine capacity could be derived. In this case the car was named the 340, thus an engine size of 4080cc. In reality and on closer inspection of the sales brochure the engine capacity was marginally larger than this at 4099.58cc, this being derived from a bore of 80mm and a stroke of 68mm. As was common at that time compression ratio was comparatively low at 8.0:1. But with a relatively large capacity and breathing through three twin Weber carburettors the engine delivered a maximum power of 220hp at 6000rpm. Driving through a non-synchro five speed gearbox this produced a healthy 71kph (44mph) in first gear rising to a maximum speed of 240 kph (150mph) in fifth. All in all a neat new package, however close inspection of the sales brochure and its illustrations revealed that the illustrated engine on page 8 was in fact a 212, page 7 shows a regular 340 engine. So where one might ask were the potential buyers for this new larger engined Ferrari. With the addition of the name "America" to the 340, Enzo Ferrari made clear that the car was mainly intended for the lucrative American market which was mainly dominated by home produced cars with large engines and the more sporting imports like Healey and Mercedes from other overseas markets. The international press received the 340 America with considerable acclaim. The British magazine "Autosport" mentioned in the May issue of 1951 that the new Ferrari was capable theoretically of breaking the semi-official speed record for production and sports cars without any special preparation. "Road & Track' commented in the December 1950 issue that the new Ferrari was almost certainly the world fastest production car, out performing the Jaguar XK 120 and the Talbot Lago the then leaders in this field. The engine of the 340 America was an entirely new design but not by the much respected Gioachino Colombo had been responsible for the design and development of the existing Ferrari engines. The reason for this change were the disappointing results of Ferrari in Grand Prix racing where Alfa Romeo dominated with the tipo 158 Alfetta. Nonetheless the Alfa equipped with the 1500cc Vl2 Colombo engine with double Roots-compressor was deemed short of power. A promising young engineer Aurelio Lampredi, who had served as an assistant to Colombo, was convinced that he could obtain more power and better fuel consumption from an unblown 4.5 litre engine. By 1949 his arguments with Colombo that this was the way forward led to a rift between them but Lampredi managed to convince Ferrari to allow him to design and build this type of engine. Originally conceived as a Grand Prix engine of 4.5 litres the design was accepted and 'adjusted' to suit a variety of cars. His new engine should really be considered a development of the existing V12. Since the unsupercharged capacity allowance in Grand Prix racing was 4500cc Lampredi's goal was to get as close as possible to this maximum allowance so he increased the engine dimensions by about 13cm (5 inches). This was necessary because the original distances between the centres of the bores were too small to implant larger pistons. This extension of the block led to the Factory christening it the 'long' engine. The 'long' engine had an angle of 60 degrees but unlike the Colombo unit there is a cylinder head with screwed-in cylinder liners bolted to the crankcase. 0204A, A Vignale bodied spyder. Each cylinder head has 6 intake ports so 12 in total, single camshafts per bank and roller cam followers. Screwed in wet cylinder barrels were employed to maintain cylinder head integrity in view of the high compression requirements of the alcohol based fuel mixtures. There were many changes to the existing V12 design but of course the most striking and simplest was that Lampredi departed the supercharged principle in designing a large volume engine. This fundamental change in direction proved to be successful and Ferrari duly appointed Lampredi as the chief design engineer. Colombo departed, but not to disappear from success, he joined Alfa Romeo and subsequently Maserati where he was responsible for the design of the beautiful tipo 250F, a car, which was destined to bring Maserati major successes in Grand Prix racing. So by early 1950 the first Lampredi 'long' block V12 was being produced. As previously mentioned, the original intention was to design and build a 4500cc Grand Prix engine, but that is not how this new design fist appeared. Quite why it happened this way has never been explained. For the 1950 Mille Miglia, that car destroying thousand-mile race on the public roads of Italy, Ferrari entered two cars designated the 275S. Both these cars, one driven by Villoresi/Cassani and the other by Ascari/Nicolini, were the first Ferrari's equipped with a Lampredi engine and both had a capacity of 3322cc. So how did these new engines fare in this first event? It wasn't a huge success. At the halfway point, on the Pescara-Rome section, both cars were forced to retire because of gearbox problems, perhaps the engines had produced too much power for the adapted chassis and transmissions! In spite of this inauspicious beginning, for Aurelio Lampredi the Ferrari 275S was the start of a series of successes. In the history of the 340 America both these cars are of considerable significance because the engines were the first and later they were adapted to the tipo 340 engines. This may be the reason why they are often counted as being a 340 America. After some modification to the coach-work one of the 275S cars was sold to a 15 year old boy for 500 (!) dollars. The boy, who became a man, sold the car in 1999, for perhaps a little more! 0114A, Often said to be the Paris 1950 car. Trying to discover the history of Ferrari chassis numbers is a tricky and time consuming business. This became clear on reading about the Paris Autosalon in 1950.Generally it is recorded that the 340 America at the show was 0114A, but this does not seem possible. On researching this particular car 1 had the opportunity to see the it with my own eyes and even had a ride in it in a beautiful part of Switzerland. Unfortunately the car isn't equipped with the original Lampredi engine any longer but even the smaller 250 GT engine knows how to give the car wonderful performance. Knowing that 0114A is still with its original coachwork it was possible to compare the car with pictures of the Paris Autosalon. It became clear that those two cars are not the same, considerable differences can be seen in the length of the bonnet, the position of the windscreen the interior and the grill. Besides the official building sheets of the car showed the 0114A was built at a later date than that of the date of the Paris Autosalon. It is more probable that Ferrari exhibited chassis no. 0030MT which is the converted 275S. This car was black in October 1950 and had a green leather interior, which as it happens were the colours of the car which was diplayed. Limited production of the 340 began in 1951. 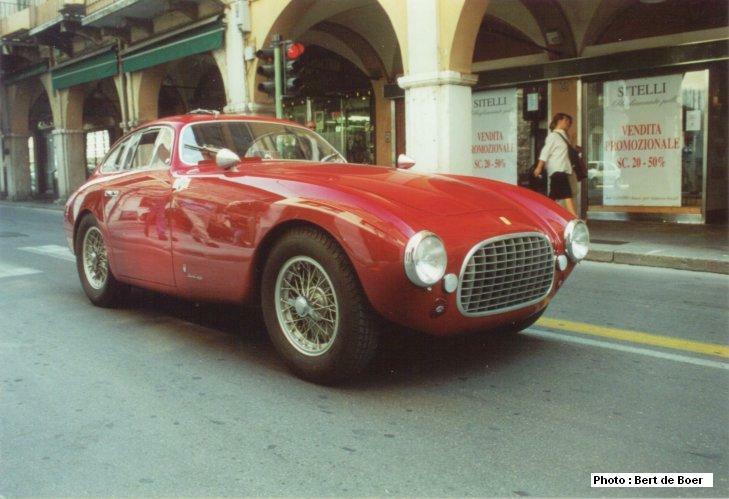 The first car build was 0082A, a car designed by Vignale with berlinetta coachwork. After this car seven further cars were built but these were equipped with coachwork designed by Carrozzeria Touring. Five of them were barchetta" (# 0114A, 0116A, 0118A, 0120A, 0124A) the remaining two were berlinettas (# 0122A, 0126A). With the first 340 America there also came success in competition. 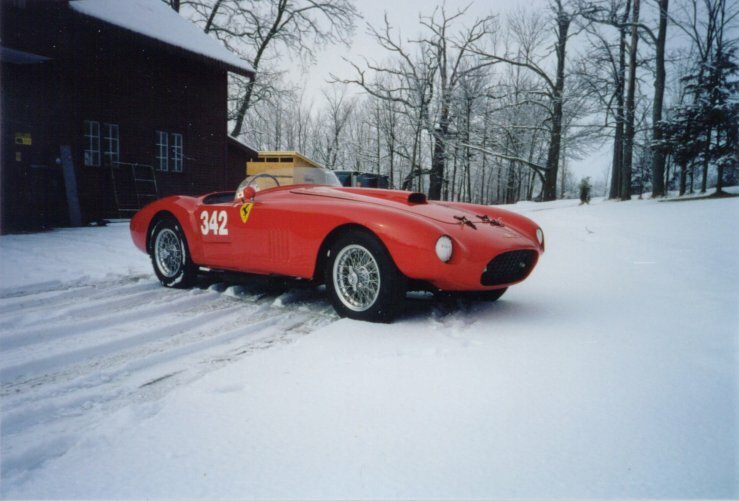 There is a rumour that the first victory of the 340 America was at the Coppa Inter Europa at Monza, April 1951. But as often it is doubtful. Although the car driven by Luigi Villoresi looks quite the same as 0082A it is more likely that the car was a 212 Export. 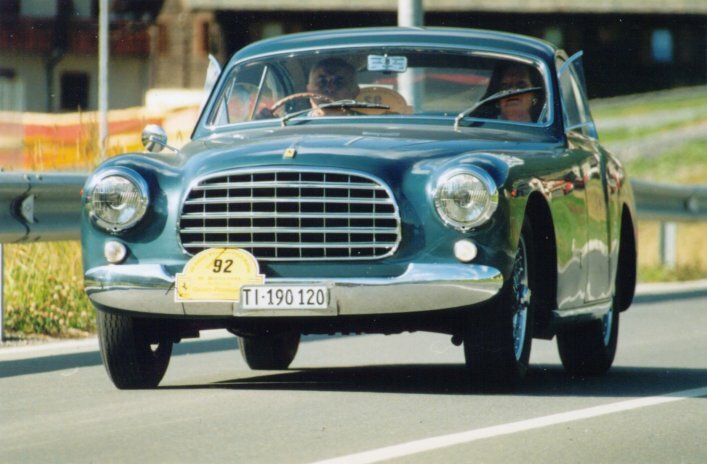 The first major success for the 340 America came a couple a weeks later when Luigi Villoresi won the Mille Miglia. In spite of a badly damaged car Villoresi was the first to return at Brescia. During this event four other 340 America's participated. Two of these cars were 0030MT and 0032MT the former 275S. 0030MT was driven by Vittorio Marzotto and 0032MT was driven by Dorino Serafini. The car which Alberto Ascari drove remains, for me, a mystery. Two months after the Mille Miglia it was time for the 24 hours of Le Mans. 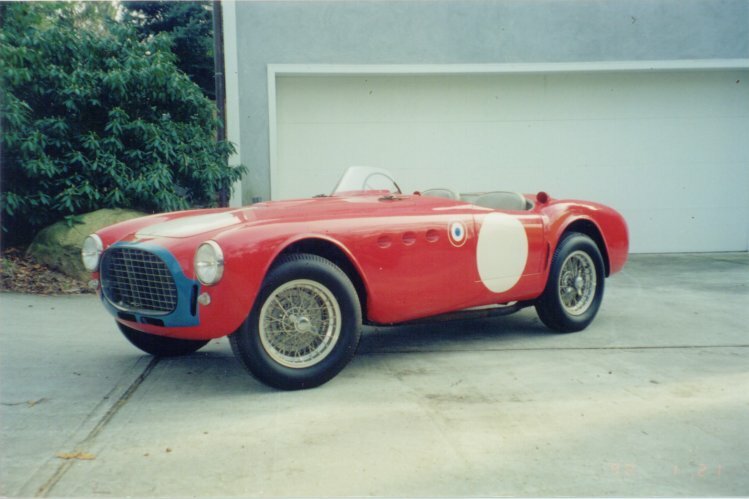 Four 340 America's were entered, all cars equipped with Touring barchetta coachwork. It wasn't a success. Jaguar, Talbot and Aston Martin and Jaguar didn't give the Ferrari's a chance. Of the four participating Americas three are easily identified, 0116A was driven by Louis Chiron and Pierre Louis Dreyfus (known as "Helde"), 0118A was driven by Bill Spear and Johny Claes and 0120 was driven by Edward Hall and G. Navarone. The fourth barchetta, (chassis number unknown) was driven by three times Le Mans winner Luigi Chinetti and Jean Lucas. It's often been said that the car Chinetti and Lucas drove was 0124A, but I cannot believe that to be so. Just as the car in the Paris pictures, those of the 1951 Le Mans clearly show that the car had a short bonnet, a different wind-screen and in particular an extra air-intake above the grill, all characteristics which differs from the later built 340 America Touring barchettas. So for me its true identity remains a mystery. It was however the only 'team' which managed to reach the chequered flag while the other teams didn't finish because of technical problems or even because of a disqualification (refuelling before it was permitted). Walker and Whitehead were the winners of the 1951 Le Mans in their Jaguar XK 120 C.
1951 was not a notable year for success in sports car racing for the Scuderia. There were no significant successes in Europe except for Casmiro de Oliveira who drove 0082A to victory in the sports car class in the Grand Prix of Portugal. Exactly one year after its introduction in Paris, Ferrari introduced a revised 340 America at the Paris Autosalon. It wasn't a sports car this time rather a car which was equipped with a 2+2 chassis and a coupe coachwork 0130AL, this time designed by Ghia. It's clear that Ferrari had decided that commercial sale was possible with this car. As a matter of passing historical record 0130AL was imported into the UK by Brookland of Bound and it became the first road going Ferrari in the UK. After 0130AL eight of the cars built were marked as 'street car' and not as sports car. After 0130AL the next three cars were bodied by Vignale, each with unique coachwork. The first one was built as a coupe, 0132A, built to special order of Johnny lsmael, the car was endlessly equipped with chromium. The next one was built as a cabriolet, 0138A. This car ended up in the collection of Lord Brocket and was reported 'stolen' in 1991. The car turned out to be one of those involved in the insurance fraud but rather than being completely destroyed is now fully being restored. 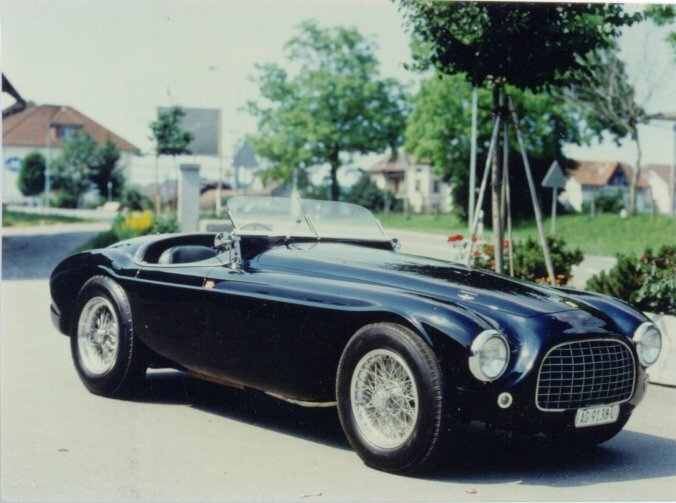 The third car in the Vignale series was a spider, 0140A. This car can often been seen today in Europe competing in events like the Mille Miglia. After this small series of Vignale bodied cars it was now the turn of Ghia who built the bodies the next 4 cars. They became four identical looking bertinettas (0142A, 0144A, 0148A and 0150A) very similar to the former 212 Inter cars which had Ghia coachwork. 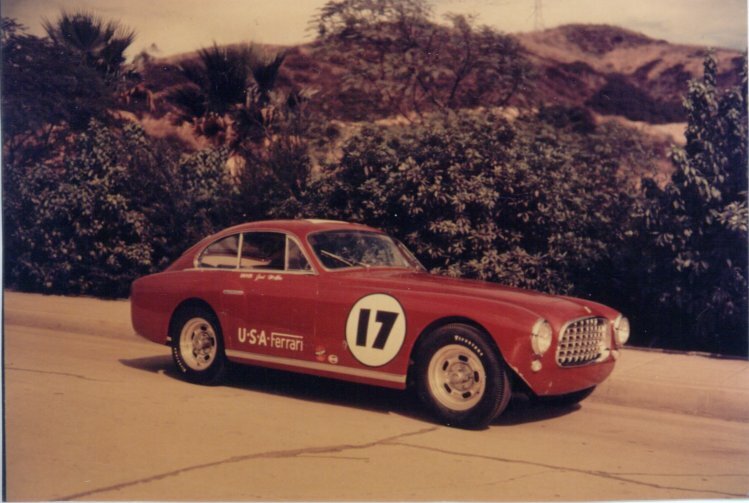 Although these Ghia cars were meant to be streetcars one of them, 0150A, was prepared by its owner Tony Parravano for one of the most brutal races in the world, the Carrera Panamericana in Mexico. Jack and Ernie MacAfee, (not related) took the car to a very deserving fifth place overall. The last seven 340 America's were again completed by Vignale. They became four spiders (0196A, 0202A, 0204A and 0238A) and three coupes (0174A, 0206A and 0212A). To begin with all four spiders were very much the same but in time 0196A and 0238A received revised bodies turning them into coupes, designed again by Vignale and both unique in their way. 0238A, was initially the centre of some confusion. The Swedish importer, Tore Bjurstoem, who ordered the car was kept abreast of the progress of the build of the car by Enzo Ferrari personally. In two faxes Enzo talked several times about a 340 Mexico, which was a different series of 340's designed as a pure sports car for the Carrera Panamericana of 1952. 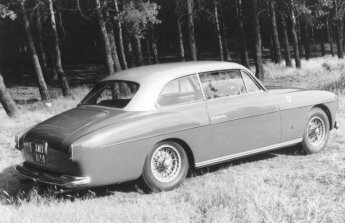 However the car was delivered to Sweden (to Bjurstroem) as a Vignale Spyder in 1953 and was sold to Severt Sundberg. The new owner crashed the car and was killed. The remains of the car went back to Vignale and was rebodied in the style of a 'Mexico' Coupe then sold back to Sweden to Valdemar Stener. Just as 1951, 1952 wasn't very successful for the 340 America. During the Mille Miglia only two 340 America's participated and neither finished (although Ferrari did win the event). More interesting are both coach-works. One of them was 0196A with its original spyder coachwork, the other one was 0030MT. This car, put in by the famous Scuderia Marzotto and driven by Comoti and Ronchi and was equipped with a coachwork designed by Fontana di Padova. A very rare appearance. During the 24 hours of Le Mans Ferrari put in four 340 America's. One of them, 0116A, was driven by Rene and Pierre-Louis Dreyfus, (know as Helde), both had participated in 1951 and sadly once again the pairing failed to finish. Other participants were Louis Rosier and Maurice Tritignant, 0202A and Luigi Chinetti and Jean Lucas, 0204A, but also these teams fell out before the 24 hours. The only 340 America, driven by Andre Simon and L. Vincent, who did finish, was 0206A which came fifth overall. So after two years of production the end of the 340 America came in 1952. Ferrari decided to make a clear distinction between sports cars primarily designed to compete and street or road cars. The new model designed for road use was the 342 America, which illustrated in its refinements that Ferrari recognised he needed to make more concessions to his customers and their driving comfort. The engine was 'tamed' to 200hp and it became possible to order a car with left-hand drive.